The Interactive Quote Matrix displays the same content as the regular Quote Matrix, except that the data is not exported but displayed directly in MAXQDA in an interactive window. The Interactive Quote Matrix is therefore usually preferable to the regular Quote Matrix. Activate the documents and codes you wish to include in the matrix. If none are activated, all documents and codes will be included. Open the function via Mixed Methods > Interactive Quote Matrix. Use variable conditions to determine which documents are to be displayed in the columns (a separate column is created for each variable condition). You can find a detailed introduction to deinfing columns in the section on Crosstabs. If necessary selected the options Only for activated documents and/or Only for activated codes. The first column displays a list with the codes you selected. MAXQDA automatically adds the parent codes of the activated codes in order to retain the code system’s hierarchical structure. Tip: If you selected the option Only for activated codes, you can change this later in your “Code System” to adjust the selection of displayed codes in the interactive quote matrix. The other columns are the results of your selected variable conditions: for each defined condition, a column is displayed. These columns contain the coded segments of the documents which meet the respective variable condition. The number of documents per column is indicated in the column headings. Click on a code in the code tree to list its coded segments in the columns. The column headers indicates how many coded segments are displayed in the column. A maximum of 4 columns with coded segments are displayed. If you have created several columns, there is a slider at the top of the toolbar that lets you switch between the different columns. Tip: The Interactive Quote Matrix function can also be opened directly from the Code Matrix Browser or from a Crosstab. When working with the Code Matrix Browser or a Crosstab, click the first icon on the very left. 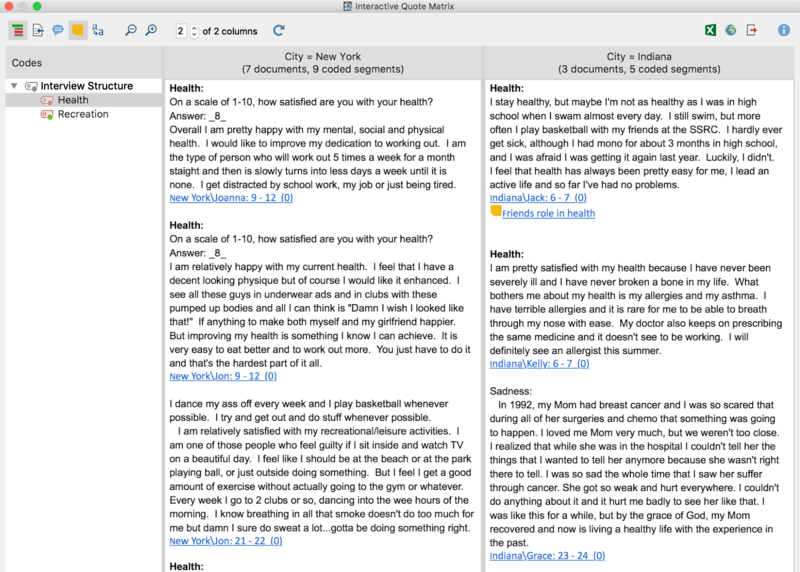 The Interactive Quote Matrix can also be opened by selecting: Analysis > Compare groups > Qualitative. Display codes with hierarchy – if this option is activated, the codes are displayed in a hierarchical tree structure. The non-activated parent codes may be displayed to retain its hierarchical structure. When the option is deactivated, the codes are displayed in a linear list. Should you have selected the option “Only activated codes” when creating the matrix, only the activated codes will be displayed. Display origin – shows the source documents, locations within documents and the code weights in brackets below the coded segments. Clicking on the displayed source document imports the corresponding document into the document browser and highlights the coded segment. Display comments for coded segments – displays all the comments on coded segments (if any). Display memos – displays below the coded segments the titles of memos that are present at the level of the coded segments. Clicking on the displayed memo title opens that memo. Zoom out – minimizes the display of the segments in the columns. Zoom in – magnifies the display of the segments in the columns. Refresh – reopens the options window for the Interactive Quote Matrix, which lets you customize the columns and included documents and codes. The Quote Matrix can be exported using the usual icons at the top right of the window. The segments of all displayed codes are always exported. If you limited the quote matrix to activated codes, only these activated codes are exported.